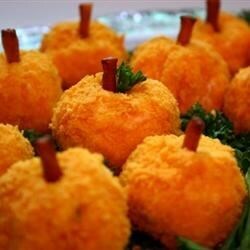 "These look great on any Thanksgiving or Halloween table! Very fancy looking, but so easy to make. (Prep time includes chill time.)" Melt butter in a small saucepan over medium-high heat until sizzling, about 30 seconds. Add garlic and sugar. Cook, stirring constantly, until garlic just starts to brown, 3 to 5 minutes. Immediately remove from heat. Transfer garlic mixture to a bowl. Add cream cheese, green onions, and garlic salt. Beat using an electric mixer on medium speed until creamy. Cover and refrigerate until firm enough to handle, about 30 minutes. Shape chilled cheese mixture into golf-ball-sized balls. Roll each ball in crushed cheese cracker crumbs and slightly flatten the bottom. Press 1/2 a pretzel stick into the top. Repeat with remaining cheese mixture. Spread parsley out on a serving plate and place mini cheeseball pumpkins on top, leaving enough room in between for parsley to show through. When decorating, rip off tiny leaves of parsley and place under the pretzel sticks on top of the balls, if desired.